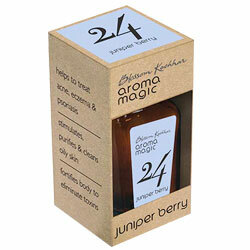 Aromamagic Juniper Berry Oil- Treats acne, eczema & psoriasis, purifies & cleans oily Skin. Fortifies Body to eliminate Toxins. Treat acne, eczema and Psoriasis. Helps to treat acne, eczema and psoriasis. Stimulates purifies and cleans oily Skin.